Sleek and organic and expensive looking. Great night stand lamps, or use for side tables in a living room, or on a console table in an entry hall. The concrete texture is super cool, calm, and collected. The weight of the lamp gives it design gravitas. 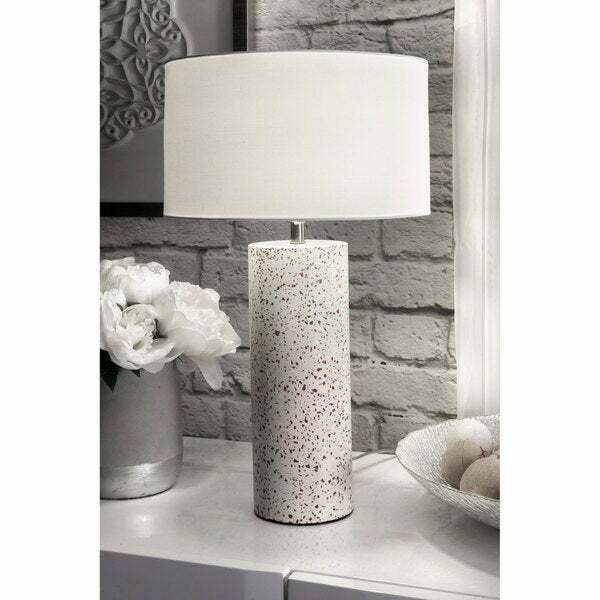 Add a touch of vintage with the addition of this classy, 20-inch high, concrete and marble table lamp. It has a 12-inch wide, cotton drum lamp shade that delivers ambient lighting. The base is made of concrete and marble. Keeping in tune with its modern design, it has a clear lamp cord with an inline switch. To be used with a maximum 60-watt lightbulb. Light bulb not included. "What colors are in the base"
The base is an off white/ beige tone with flecks of brown and a warm powdery light pink tone. Safavieh Lighting 33-inch Estill Table Lamp (Set of 2) - 17" x 17" x 34"